Per capita, Vermont has the coolest gravestones in the U.S.A.
It’s no use trying to hide from the dead. The world is a cemetery. Vestiges of the departed are always beneath our feet — take the autumn leaves we kick aside. Some hold their breath driving past cemeteries. Others like to stroll the paths and read the gravestones — which, in Vermont, can be both works of art and pieces of history. Some may call this pastime morbid. But we are the walking dead, the grave our own destiny. Why should we fear those who made it there before us? In the spirit of demystifying what so many find spooky, we provide a primer to the best necropoli in Vermont. With the aid of lots of legwork, first-person sources, various cemeteries’ websites and Findagrave.com, we’ve learned the stories behind some of the most interesting graves in the state. When Italian immigrants flooded Barre at the turn of the 20th century, the craft of carving Rock of Ages granite took on a bold, beautiful and decidedly weird new shape. And those craftsmen took care of their own. Really good care. The graves of simple artisans and their families surpass anything Shelley’s mythical tyrant Ozymandias could have wished for. Take Barre’s very own recreation of the Pietà. Sam Palmisano, chef/owner of Pulcinella’s in South Burlington, relates that his grandparents brought back “little statues” of Michelangelo’s masterpiece from their final excursion to Italy. The sculpture was his grandfather’s favorite, and “After his passing, in 1974, my grandmother wanted the headstone to be that statue.” It now stands over the graves of Palmisano’s grandmother and great-grandparents. Perhaps the most touching artwork on the grounds is the grave of Louis Brusa. An activist for himself and other granite carvers, Brusa — whose work can be seen throughout the cemetery — made it his life’s mission to make ventilation systems mandatory in granite sheds. Dying of silicosis caused by years of inhaling stone dust (a common fate for Hope inhabitants), Brusa secretly carved himself a tombstone: his wife holding him as he gasped his last. Though many families strive to enshrine their loved ones for the ages, most resting places don’t attract bus tours — which bring scores of visitors to view Hope’s examples of Vermont ingenuity. The place isn’t just a cemetery: It’s a museum. Green Mount is the dark horse of Vermont’s mega-cemeteries. While Hope has a lush, largely flat patch of acreage, Montpelier’s largest graveyard is almost entirely on an angle. The older stones on the grounds, mostly positioned to the right at the very top of the slope, have a distinctly English feel about them, in contrast to Barre’s lusty continental flair. Case in point: Ned the Dog. The grave of Fred Stevens does not enshrine the man himself, but rather his trusty spaniel. 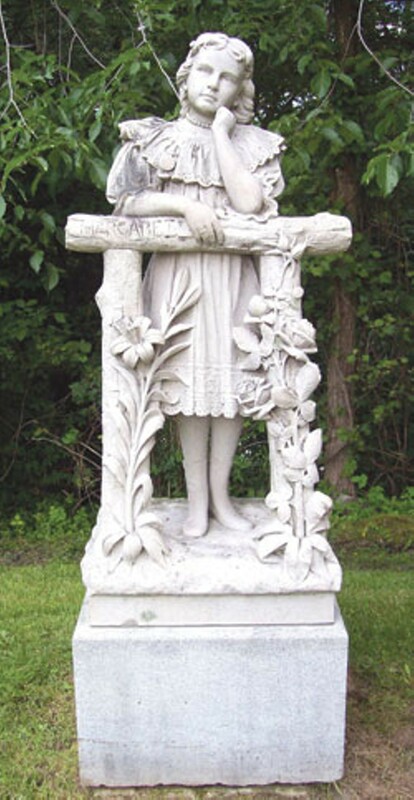 Then there’s 6-year-old Margaret Pitkin, who died in 1899 but lives on in effigy as a pensive, pinafored little girl, the picture of Victorian propriety. Mourning their child, wrested too early from them, the Pitkins asked the artisans to work from a photograph and create a life-sized likeness of the girl. Mr. Pitkin refused to pay for the monument after he noticed a button missing from the statue’s shoes. He backed down when the carver pointed out the same button was missing in the photo. Perhaps the largest gravestone in Vermont, the sepulcher of William Stowell is a boulder toward the front of the cemetery. Stairs carved into the massive rock allow visitors to climb to the top from street level and enjoy the view of Montpelier below. Nearby, the remains of a tree trunk have been crafted into a throne. One new stone stands out even from the highway. The polished black marble welcomes visitors to the resting place of Raymond (“Ray the Cop”) Quero and his wife Roxanna. “Roxy,” who works as the state senate’s office assistant, is still very much alive, but she smiles from the stone behind a proud, uniformed Ray. Emblems of their lives decorate the stone, from a gold Statehouse dome to a mini-resume for Ray, which notes his summers spent working at the Dairy Barn down the street. From the 19th century to today, Green Mount proves that life is in the details. Some of us can afford to mourn more than others. John Porter Bowman didn’t quite have the resources of Shah Jahan, who built the Taj Mahal as a mausoleum for his favorite wife. But Bowman had already made a fortune in leather when the women in his life started dying off. His first daughter, Addie, lived less than four months of 1854. In 1879, she was followed off the mortal coil by her sister Ella, who died at 23. When Bowman’s beloved wife Jenny died six months later, he was left alone. The sorrowful Bowman put his money to use: He simultaneously commissioned a new home, and a mausoleum directly facing it, at the front of Laurel Glenn. Business kept him in New York much of the time, but in free moments he headed back to Cuttingsville to stay across the street from his family. 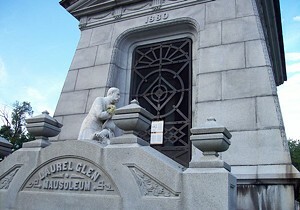 His heartbroken visits are commemorated on the mausoleum. At the top of the structure’s steep steps kneels a marble John Bowman. Clutching the monument’s key in one hand and a funeral wreath in the other, he appears eager to enter the building. (Visitors also often place flowers in the same spot.) Inside, a mirror-lined room reflects rusted-green candelabra and the busts of Bowman, Jenny and a life-sized statue of baby Ella, reaching for her parents. Their organic bodies are stacked in vaults in descending order of passage. Above them all, the inscription “A couch of dreamless sleep” leaves visitors with an unsettling lullaby. Inscriptions on older Burlington gravestones tend to read like a street map, with Blodgetts and Flynns galore. But for a more diverse flava, one need look no farther than North Avenue. First established in 1871, Lakeview was meant to echo Cambridge’s Mount Auburn Cemetery and Paris’ Père Lachaise. The concept of a “garden cemetery” (or memorial park) was both romantic and pragmatic in a time when the urban dead were piling up. Literally. City burial grounds were full, so new ones took over rural spaces. Visible from the road, Ethan Allen’s massive monument stands tall. Too bad he may not be there. A source at the Ethan Allen Homestead says Allen was buried near the home of his brother Ira. His will requested that he be interred under arms, and that his friend James Hawley “draw good liquor” for the funeral guests. Many other members of the Allen clan rest in Green Mount, in body and stone. Ira Allen, always the overlooked, more cerebral brother to Ethan’s boorish bruiser, rests beneath his brother’s memorial. Other Allen relatives lie in intricate, Crusaders-style tombs. Evergreen also holds a rare example of a “security coffin.” Timothy Clark Smith, who died in 1893, so feared the Edgar Allan Poe-esque fate of live burial that he conceived an elaborate setup. It included a window in the earth positioned over his face, which he hoped would allow above-ground visitors to witness his panicked gasps, and a warning bell for him to pull should he awake in the coffin. The bell is no more, and the window is misted over with more than a century of condensation — not, one hopes, from Smith’s last breaths. The story of how a long-dead Egyptian ended up in an Addison County cemetery is one of disappointment. When museum founder Henry Sheldon bought the remains of 2-year-old Amum-Her-Kepesh-Ef toward the end of the 19th century, he discovered a poor example of mummy flesh if there ever was one. The toddler’s head was flattened in transit, and his tattered bandages barely covered his decaying remains. Not sure what to do with him, Sheldon hid the body in the museum’s attic. In 1945, George Mead, a trustee of the Sheldon Museum, sent the messy corpse into the fire. He buried the boy’s cremains at West Cemetery, beneath a stone that dates his death at 1883 B.C. In Catholic-dominated Burlington, it’s easy to forget that Vermont was the birthplace of the Church of Latter Day Saints. Joseph Smith, the founder of what is more commonly known as Mormonism, was born in South Royalton, where his grandfather Asahel purchased a plot of land from Ebenezer Dewey, one of the town’s original grantees. The cemetery saw its first burials in the 1790s and received 49 Dewey family members in all. The Church of LDS has adopted it as home to the Joseph Smith Birthplace Memorial and museum, although Smith’s own remains reside in Nauvoo, Michigan. Senior missionaries began restoring the burial ground’s cracked stones and righting fallen ones in 1993. Some people live for their work. Jack Crowell, owner of the National Clothespin Factory in Montpelier, was one such man. A decade ago, he took his ardor to the grave, where his life is memorialized in the otherwise unassuming Middlesex Center Cemetery in the form of a giant clothespin. “We originally heard that he wanted a spring in the clothespin so children could teeter on it,” notes sister-in-law Betty Crowell. The factory, now listed on the National Register of Historic Places, was the last wooden clothespin manufacturer in the United States. Today it produces plastic clothespins and barrettes, but the stately granite monument to tradition endures. If you actually want to resurrect a favorite flavor, head for the company’s website, where there’s a handy form for the purpose. In today’s climate, Economic Crunch (vanilla with chocolate-covered almond, pecans and walnuts) could be a natural choice. Click here to watch Alice's fun slideshow of Hope Cemetery!